Changing of the bulb... a day in the life. 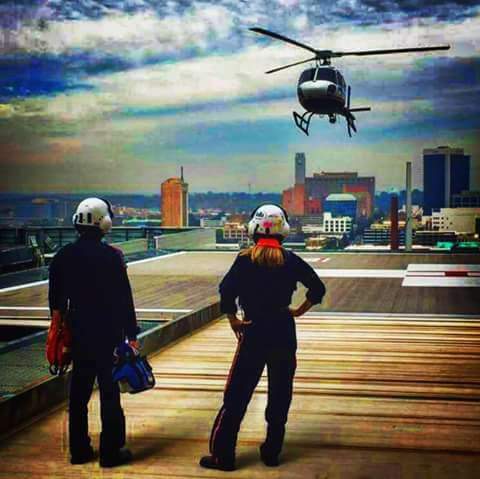 I didn't write this, I think Klank - the screen-name of a very-funny EMS pilot who used to post on the Just Helicopters bulletin-board site to everyone's delight - wrote this about life in the world of HEMS. Enjoy. Our monthly base meetings are not the only thing that bleeds once a month and doesn’t die. Man how I despise the hours of talking about nothing and the endless gossip and rumor hashing that goes on. During one fine cycle the topic turned to the light bulb in the nurse’s bathroom, it burned out a week ago and was still out. As we all sit there with our eyes glazed over wonder what in the hell is that guy talking about the area manager (Stan the Worm) trying to move the meeting along states “Well then, the mechanic will get your bulb changed, anything else” Greta the Hun as we call her barks out “Well it’s been a week and I think it’s a SAFETY ISSUE, I have to go in there in the dark and I don’t feel we should be subjected to such unsafe working conditions, what the hell is the matter with this company anyway and” It goes dark for sometime as she rambles on endlessly on how screwed up everybody and thing on the planet is and on and on. As I come back from my happy place deep in my mind our mechanic Lenny (The Loser) walks in. (have you ever heard of someone so sharp that the phrase is “he forgot more than you will ever know” well Lenny forgot it all) “Lenny” Stan the Worm calls out “Can you give us an update on the status of the light bulb?” “What bulb” our not to bright coworker replies. Wilfred interjects “I sent an email to the Director of Maintenance with a attachment to the Chief Pilot and the Director of Operations that we were not properly equipped to safely pursue this issue to it’s conclusion” Another pause as we look at each other like deer in the headlights. “Lenny, could you change the light bulb in the bathroom?” I ask, as I now understand the purpose of the five-day waiting period on the purchase of a handgun. “Sure” as he wanders down the hall, can this meeting finally end I pray to the big guy up there. “Hell it works fine,” Lenny yells from the hall, “The other bathroom” several of us yell in unison as our eyes roll in our heads. “Lenny, take the bulb out of the lamp on the pilot desk and put it in the nurses bathroom please” I direct as I just can’t take it anymore. Finally the monthly meeting from hell has ended, as we all start getting up and placing our different chairs and cups and such to the appropriate places we here a loud crash followed by running water. Lenny limping down the hall, soaking wet states that while standing on toilet to change the bulb, well you can figure out the rest. Perhaps the most difficult task for a flight crew is to maintain their sharp edge when flight after flight occurs without incident. The aircraft we operate are incredibly reliable; serious malfunctions, like engine failures, occur once in a lifetime - but they do occur. The desirable state is to always be "ahead of the aircraft," so that no event or occurrence is unanticipated. This is tough to achieve at 3:00 AM when we are returning to our base in the country after dropping a patient at a metro hospital. Human nature dictates that we get excited for the exciting parts of a flight, and relax for the milk run to the house. If you have spent any time studying aircraft crashes, you know that the most common last words spoken by an aircrew are some variation of "OH CRAP." A couple of nights ago, I woke up at 2:00 AM and began to think about the need to fight complacency and be prepared for whatever whenever. There have been some instances of engine failure in the aircraft in my company's fleet in the last few years, and more than one case of running out of fuel - this too causes a loss of power. These events have resulted in fatalities and destroyed aircraft. Yes, a single engine helicopter can be safely landed after it's lone source of propulsion packs it in, but the infrequency of such failures, coupled with the sterile (read "safe") manner in which we prepare for these autorotative landings, results in a pilot and crew who are poorly prepared and "startled" by a real life failure. It is that startle-effect that we need to eliminate. In a perfect world, a bird coming through the windshield would be calmly announced over the interphone communication system, followed by a normal precautionary landing. I fear if that happened to me, the smell from the bird's guts would be mixed with the smell from my gut. But I try and stay ready - and I keep my visor down. When I was learning to fly Chinooks, an aviation wizard named Howard Swaim taught me the practice of testing the warning-and-caution lights while flying en route (after announcing his intention of course). He would pick a light, like "engine oil pressure low" and have me discuss the emergency situation that this light's illumination would create. This rehearsal for a future contingency stood me in good stead as time went by. Indeed, much of a pilot's initial and recurrent training is designed to prepare her for a future human or system failure. The problem, as I alluded earlier, is that the training environment does not mimic the real world we operate in. Here's an idea. Brief your teams on practicing the Objective Continuous Risk Assessment Process (O-CRAP). This is what came to my mind at 2:00 AM - yes, I am a little strange. O-CRAP is nothing more than a verbal declaration prior to each phase of flight on the hazard or hazards assumed to be most likely. This doesn't mean that some other mishap or malfunction won't occur, but at least this alerts each team member into the mindset that something might go wrong. It activates a part of our brain that we use when walking through a dark forest at night, and provides a heightened sense of awareness. I discussed this with my crew this morning, and asked the paramedic "what do you think is our greatest risk on take-off?" He replied "wire strike." Fair enough, that could happen, but what my nurse for today and I worry about in a single-engine aircraft is an engine failure during climb out with the collective raised and lot's of power applied. Losing an engine at that point would result in a rapid decrease in rotor rpm, and a rapid descent to who-knows-what kind of forced landing area. It would be a lot different than pushing the collective down from level slow-cruise at one thousand feet above the threshold of a big beautiful runway - that's how we train for engine failures - because it's "safe" (but unrealistic). Engines have an annoying tendency to quit at the worst places and times, and when we least expect it. As an instructor once said, "an autorotation is a training maneuver, a forced landing is an emergency.' If we subjected pilots to unannounced engine failures in the line-environment I suspect many pilots would develop different flight techniques, to include flying at higher altitudes. The Astar flight manual directs us to climb at 55 or 60 knots (depending upon variant), with maximum continuous power applied - without stating why. The manufacturer doesn't want to highlight the risks of flying with one motor, but a thinking person can deduce that the sooner we get to altitude, which we can trade for time, airspeed, and rotor energy, the better. So - do you climb-out each and every time at the correct airspeed and the correct power setting to an altitude from which you are confident of reaching a forced-landing area? If not, perhaps you don't consider an engine failure to be a possibility - and they are rare. Or perhaps you just don't think about it. Don't put yourself in a position where the last words you say are "O -CRAP." Try and stay ahead of your aircraft and ready for whatever life throws at you. Verbalize your assessment of the proximate threat or most likely hazard for each phase of flight, and ask your teammates for their input too. And I hope you don't wake up at 2:00 AM for no good reason. It Could Never Happen To Me... The Hazardous Attitude Known as "Invulnerability"
When I stand in front of a room full of Helicopter Emergency Medical Services (HEMS) professionals and conduct a class on Air Medical Resource Management, I don't read from a script. We attempt to cover the same points in each class; but the manner, words, and phrases often differ depending on the vibe. It's hard to illuminate a topic - often associated with "safety" - in a way that keeps these bright, busy, type-A individuals in the game. They expect value for their time. I often wonder if there is some way I can express a thought, or an emotion, that will keep these friendly faces alive. I have found that it helps to discuss something other than Helicopter EMS - for hazards abound in every aviation endeavor. One particular hazard worth mention is the attitude we call "invulnerability," the mindset that a fatal crash could never happen to me . So let me tell you about a young man I never met, although I wish I had. 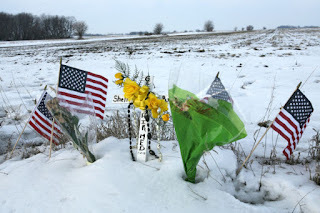 He was - by any measure - a great American, a great guy, and a fantastic aviator. He must have been a source of immeasurable pride and joy and sorrow to his mother and father. I have spent so much time thinking about Lt. Commander Kevin Davis, and his last few moments alive, that I feel as if I know him, and I hope he doesn't mind me trying to derive some use, some benefit, from his tragic death. I watched him die, and it affected me. Kevin Davis attended Embry Riddle Aeronautical University, earning a Bachelor of Science degree in Aeronautical Science with honors in 1996. We graduated from the same University in the same year. 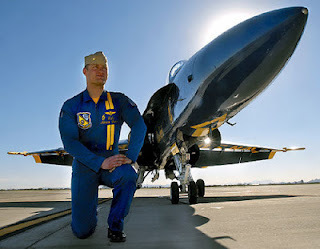 He completed primary flight training at NAS Corpus Christi, Texas, and transferred to NAS Meridian, Mississippi, for intermediate and advanced flight training. While there, he flew the T-2C Buckeye and TA-4J Skyhawk, and received his wings of gold in June 1999. 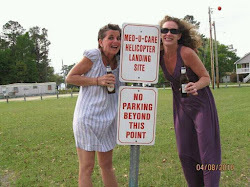 I had just retired from the Army and begun flying EMS helicopters. Kevin reported to Fighter Squadron 101 (VF-101) at NAS Oceana, Virginia, for training in the F-14 Tomcat and was the “Top Stick” in his class. I doubt that this was his first brush with being the best. His parents raised him right, and created the kind of young man that anyone would emulate, and admire. In December of 2004, Kevin graduated from the United States Navy Fighter Weapons School (TOPGUN) as an adversary pilot. Here again, he was standing out above the crowd, as the opposing-force pilots are handpicked - the best - in order to adequately prepare students for combat. 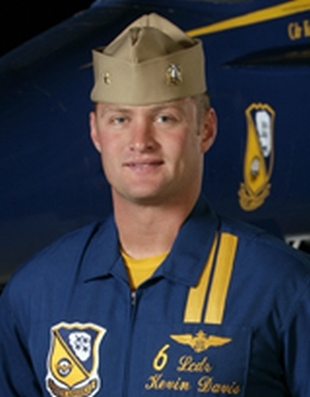 Kevin joined the Blue Angels in September 2005. His role at first was to be the voice of the Blues, and to fly members of the media and celebrity-guests in the interests of creating a positive image of the United States Navy. Thanks to YouTube, we can join Kevin on the job. I want you to listen very carefully to Lt. Commander Davis as he subjects the aircraft to high-G maneuvers. A "G" is equivalent to one times the force of gravity. Fighter-jet aircraft can maneuver such that the force of gravity can be multiplied greatly. Listen to Kevin's voice and his breathing....you may hear him grunting in a turn. Also listen to his instructions to his passenger, Steve, a reporter for the Atlanta Journal Constitution. Now, watch a famous person - a man who knows a thing or two about going fast - getting the ride of his life in a jet. During these maneuvers they will exceed 7 Gs. G forces are a large consideration during high speed maneuvers, because during positive G multiples, blood is pulled from the brain and begins to pool in the lower extremities. This leads to a gradual loss of ability, on all levels. Vision tunnels - as if one were looking down a progressively narrower tube with black around the edges. Pull hard enough and vision goes to a dot, then blackness followed by unconsciousness. The last thing to go, and the first thing to return, is awareness. GLOC stands for G induced loss of consciousness. Gray-out refers to partial loss of ability to fly. Fighter pilots combat GLOC and gray-out with special leggings called G-Suits, which might be compared in function to MAST trousers. G-Suits are automatically inflated by aircraft systems during high G maneuvers and serve to prevent O2 rich blood from leaving the brain. Blue Angel pilots don't wear G suits. This because their demonstrations require them to fly within a foot or so of each other. Such precision flying requires very fine hand movements. To facilitate this, Blues run their seats forward, which raises their upper legs. They rest their forearms on their legs and make control inputs by moving their hands at the wrist. A G suit might inflate and cause an inadvertent control input with disastrous results. So Blues use other techniques. They do a lot of squats, and develop muscular torsos, and when flying hard they clench their leg muscles and grunt-breath. Grunting raises blood pressure and keeps blood in the brain. They do this without conscious thought, it's a secondary task. When pilots begin flight training, the most basic tasks - like hovering, or making a normal approach to a landing - demand full concentration and effort. Ask a new student pilot a question while she is performing a maneuver,and she may be unable to answer. Manipulating flight controls to make an aircraft respond correctly takes a multitude of fine-motor skills, precision muscle movement, and constant correction and adjustment. In the beginning, it's hard. As time passes and experience comes, tasks that were once difficult become progressively easier. Muscle memory and pattern recognition combine to permit pilots to relegate what were once primary tasks to secondary status. We can perform these secondary tasks without conscious thought. And this is a good thing - it allows us to do more than one thing at once, a vital skill for any pilot. We have to fly, DECIDE, tune and talk on radios, and pay attention to what is going on around us - all at once. If we could not multi-task, we would need several crew members to do what one or two can do. Unfortunately, this ability to discriminate without awareness - what you are doing when you drive your car across town and realize after the fact that you remember nothing about the trip - can get us into trouble. When we are distracted, or anxious, or under great stress, that task that we have relegated to secondary status may not be performed to standard. A helicopter pilot who is upset upon hearing that the fuel cap may not be on the aircraft - and may instead be laying on the parking apron at the airport just departed - may be so distracted during his approach to a large field for a check of the fuel tank - that he crashes the aircraft. This actually happened. This occurred while Les and I were preparing to leave. I turned on the radio and asked the tower if they needed help. The tower advised us to proceed 300 degrees for three miles. A lone Blue orbited overhead. We flew over a small pond surrounded by people all pointing into the middle. I thought to myself, Good God, he's gone into the water. That was not the case. While some parts of the jet splashed down, other parts went smoking through roof peaks, lay here and there along a one lane road, and were embedded in a stand of pine trees. Les suggested we fly up his inbound path to search for a parachute, so we did, with no joy. Les said, "I think he rode it in so he wouldn't hit a house." The report says he had it nose-up, rolling wings level, in full after-burner, and may have been trying to save the jet. During the crash sequence, his seat ejected spontaneously and he was killed by the impact. He didn't kill anyone on the ground. A blessing. The crash at 4:00 PM ET Saturday, during a precision-flying team demonstration, injured eight people on the ground and damaged eight structures. None of the injuries is life threatening. CNN is reporting that the jet clipped the top of a pine tree during a sharp turn at the end of the team's aerial exhibition. The crash sent a plume of smoke into the sky, which the five other jets in the formation then circled. While I was in Concord NC recently, presenting this as a case study, I got to this point in the presentation and observed a young women in the back of the room with tears sliding down her cheek. It hit me. We should not take this lightly. It was a tragedy and a huge loss for Kevin's family, our country, and all of us who fly. Perhaps we can keep Kevin in mind as we go about our flying duties, and remember. The next time you are feeling invincible, bullet-proof, and like God's gift to aviation, remember Kevin Davis. Remember that if the best of the best, a superbly skilled, highly trained, disciplined and dedicated aviation professional can have a momentary lapse and lose his life, well then, anyone can... Don't let this happen to you. I listened to a discussion about the roles and responsibilities of ship's captains. The Titanic and her captain, Edward J. Smith, were presented as an example of "doing the right thing." 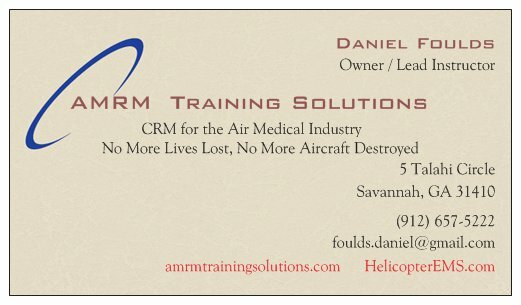 After studying CRM and AMRM for years, I think he did a terribly wrong thing, but he had help. 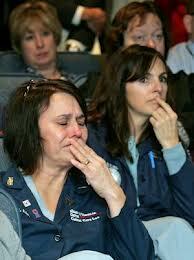 I discuss Captain Smith and the Titanic during presentations on the pressures we face in HEMS. From the accident report, " Mr. Ismay (the owners representative) occasionally accompanied his ships on their maiden voyages, and the Titanic was one of them. During the voyage, Ismay talked with chief engineer Joseph Bell and/or captain Edward Smith about a possible test of speed if time permitted..."
I believe what happened was Mr. Ismay pressured Captain Smith to run full speed all the way (including at night) in order to set a record or at least make a splash in the media. The ship's construction was over-budget and took longer than expected, and the owners were anxious to prove the ship was a winner. This is a classic case of pressure from management to get a result that may not be consistent with safety. In our case, an excessive emphasis on flight volume might well lead pilots to accept a flight when they shouldn't. Sometimes the pressure comes from within the person, with no help from anyone else. It has happened in HEMS more than once. Captain Smith had a reputation as being "quietly flamboyant" and "a millionaire's captain" and may have suffered from machoism, ie. needing to live up to his image of himself. Consider all the experienced crew walking her decks who must have known that running at speed in the darkness in those waters was folly. In Captain Smith's day, no subordinates dared question the decisions made by the captain. This was a hold-over custom from the Royal Navy, where the captain was imbued with absolute authority. That same custom carried over into the beginnings of aviation, right up until a lone KLM Captain caused the deaths of 583 people. That investigation revealed that his co-pilot was worried that something was amiss, but he lacked "assertiveness." And then there were all those dead people. And two 747s destroyed. 1. You are going to speak up. Use the name of the person you are speaking to. 2. Give voice to your concern. You own it. While we may discuss it later, and it may come to light that your concern was baseless - right now it is valid - and right now we are going to change the way events are unfolding. It's better to be alive and wrong than dead and wrong. 3. State the risks involved. Obviously, a crash and loss of life come to mind. Or perhaps a midnight swim in cold water. 4. Offer a suggested course of action. Is there a way we can still help the patient without putting ourselves at undue risk? Remember, there will be another patient tomorrow, and we need to be here to help them too. 5. You are part of a team, and you have to work together tomorrow. Honestly and calmly ask for affirmation or "buy-in." Try to avoid letting assertion become aggression, but meet aggression calmly and resolutely. 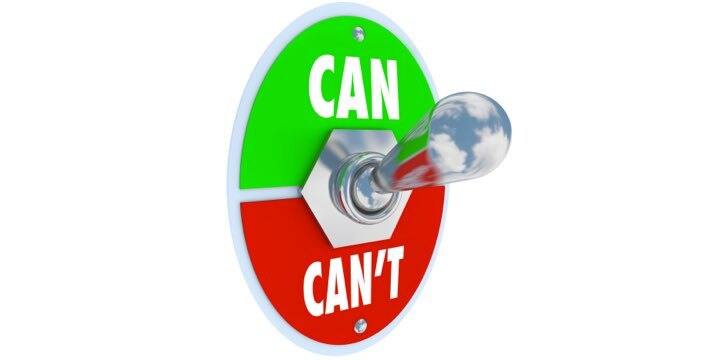 No matter whether you are new, inexperienced, or significantly subordinate to the other parties; when that time comes do not hesitate to flip the "can't continue switch." And don't think for one instant that job concerns outweigh safety concerns. You can get another job. Another life? Not so much. Captain, don't you agree that safety is the best policy; sir?"